It's Hello Kitty's birthday, and once again I asked her to choose the restaurant for her birthday dinner. Having gotten word that Amber has put together their "Amber Classics Menu" in advance of their renovation, she decided that we should go and check it out. 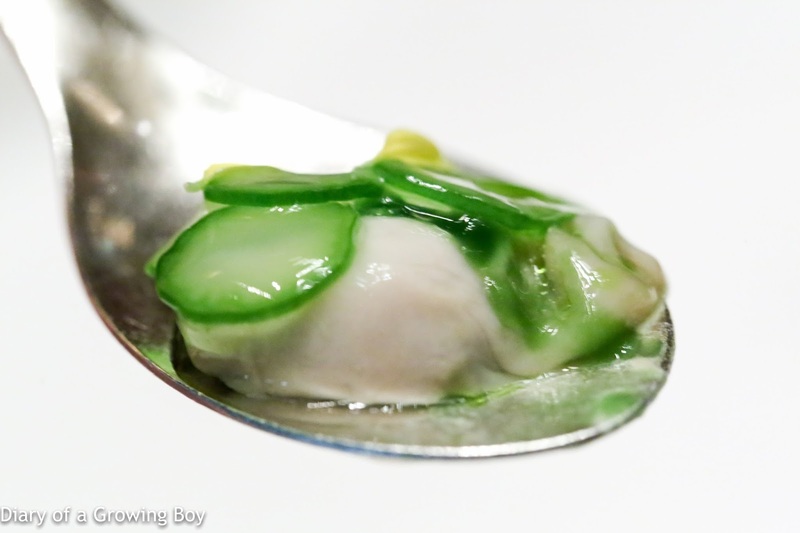 After all, it's been a while since we were last able to taste Chef Richard Ekkebus' signature Hokkaido sea urchin - thanks to it being taken off the menu last May. 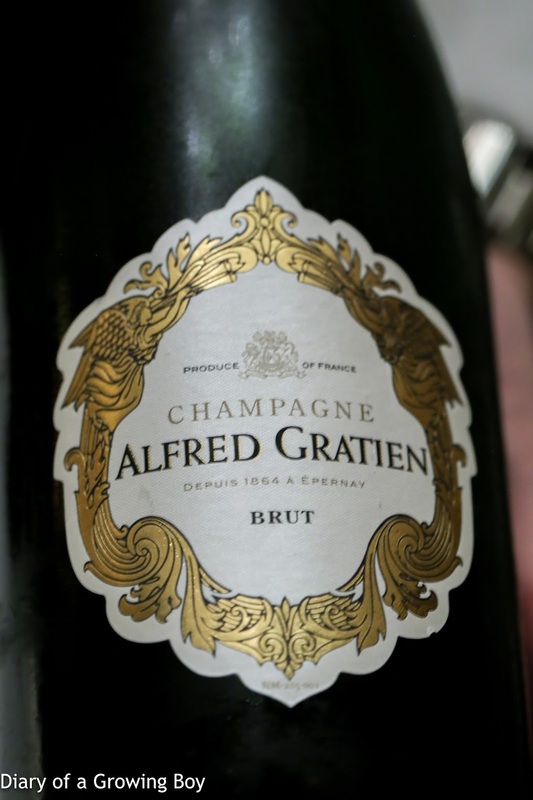 We started with a glass of Alfred Gratien Brut, whose nose very caramelized, quite mineral. Very full on the palate, with very high acidity and a grippy finish. Definitely showing the meunier side. First up was saltiness, of the sea. The Dutch oyster leaf came bearing a ball containing sea water, with a little strand of sea grapes on top. This was honestly a little more salty than I had anticipated, and the seaweed flavors were definitely very prominent. 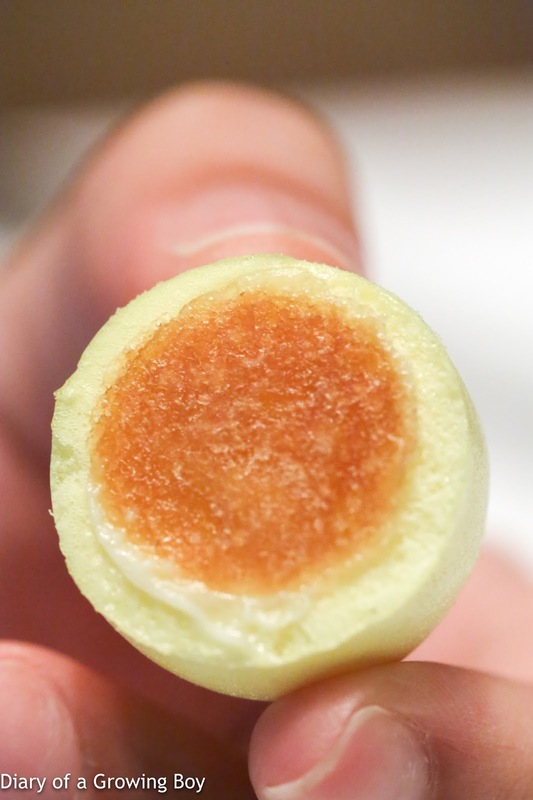 Sourness came as lemon meringue filled with lemon gel. Definitely acidic. 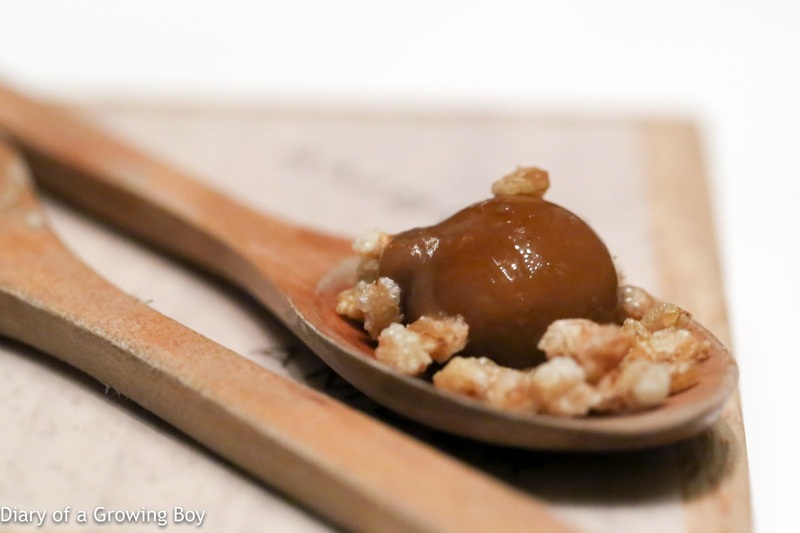 Savory showed up in the form of an old friend - Guinness Dry Stoute beer with onions and crispy cereals. The onion stew deglazed with Guinness had plenty of fermented flavors, and the caramelized onions delivered both sweet and savory flavors. The cereals lent a nice and crunchy texture. 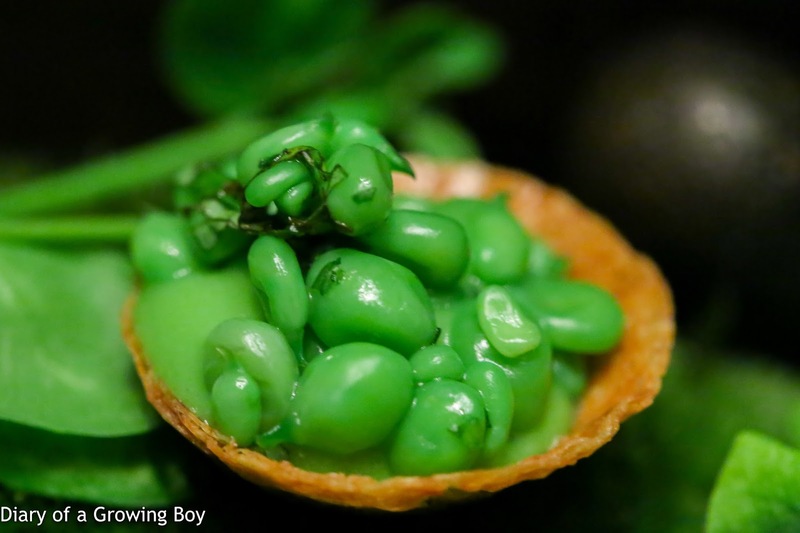 This was followed by sweetness, green pea tartlet with Hokkaido milk - which was very sweet. The tart crust itself had delicious buttery and fermented flavors. 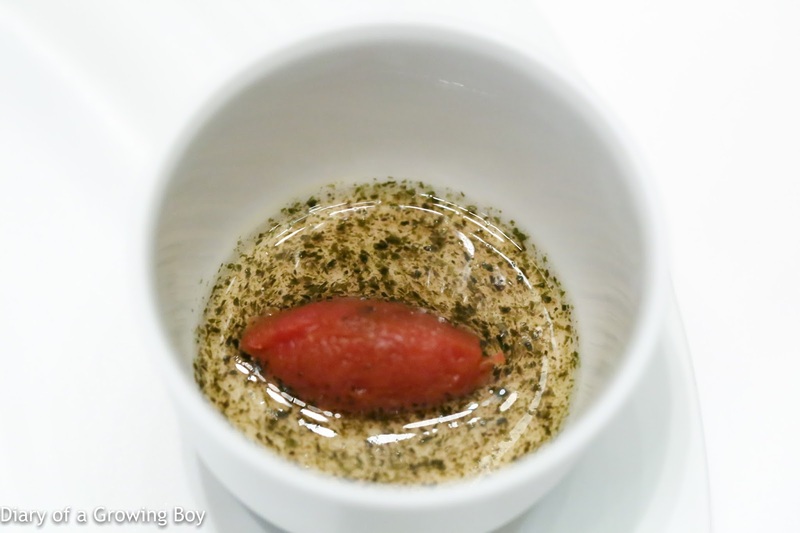 Umami - chawanmushi (茶碗蒸し) with fruit tomato compote in the middle with seaweed powder sprinkled on top. 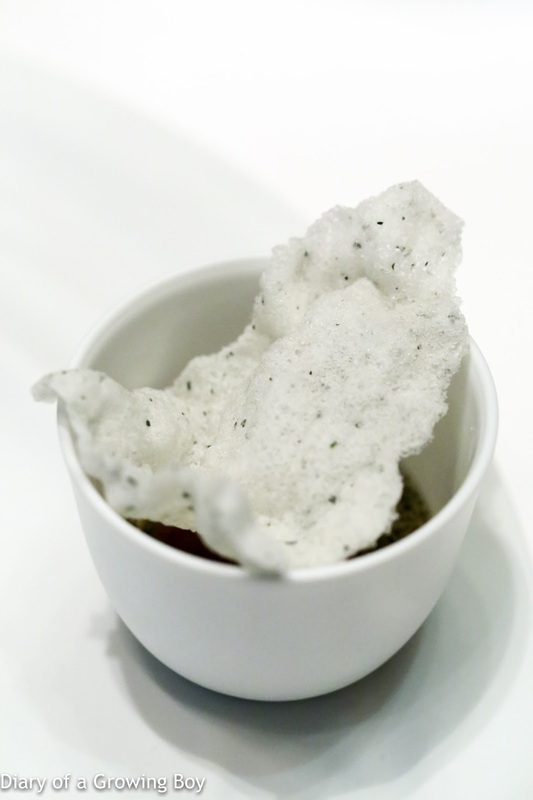 Served with crispy seaweed cracker on the side. 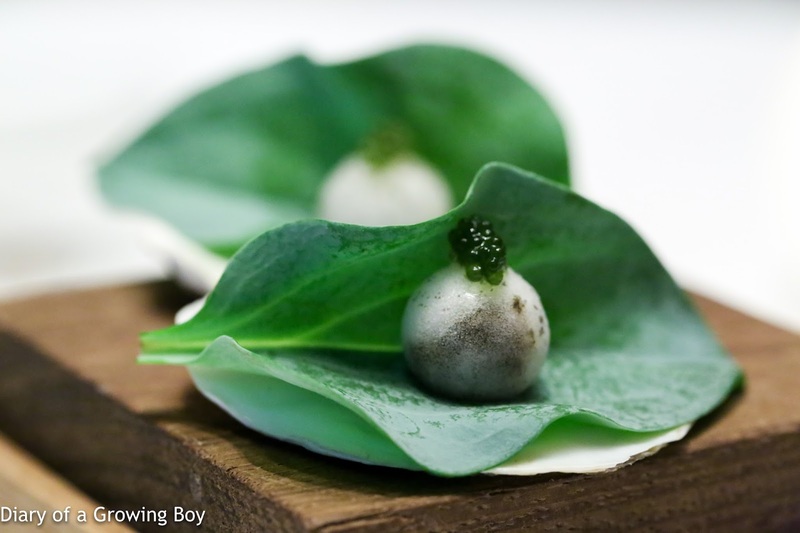 Schrenki-dauricus caviar: leek, crème fraiche and feuille de brick served like a fine tart - this also looks familiar, but tonight we've got the full size version instead of the mini amuse version - with 20 grams of caviar. 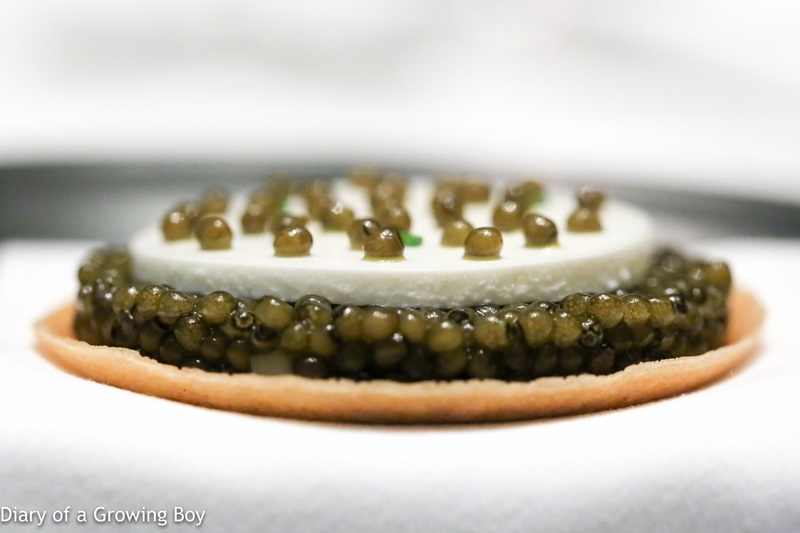 There were diced leeks on top of the crispy feuille de brick pastry just below the caviar, and a whole disc of crème fraîche on top of the caviar. I joked about taking the whole thing in one bite, but the reality is that even I don't have a mouth that can fit the whole tart in... but perhaps Julia Roberts could give it a try. In any case, this was very, very satisfying. While I have been somewhat spoiled over the last year by Russian golden osetra or even beluga, any time you get to stick 20 grams of sturgeon caviar in your mouth is a pretty good day! 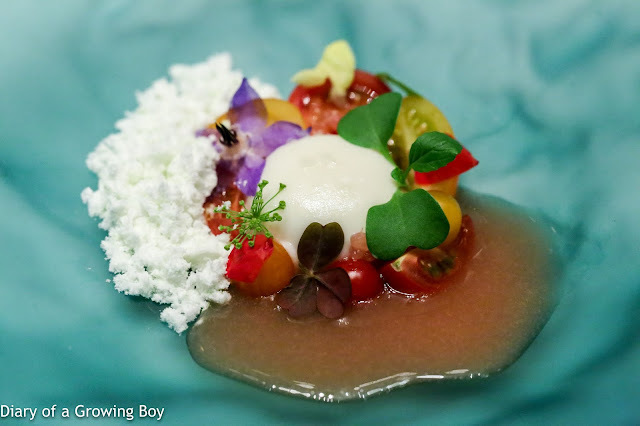 Heirloom tomatoes: pickled rose petal, solidified basil infused extra virgin olive oil, stracciatella di bufala, finger lime, watermelon and tomato water - surrounding the tomato water-infused stracciatella in the middle were four different types of heirloom tomatoes, with rose petals, edible flowers, and herbs. The watermelon and tomato water poured on the side was a mix of sweet and savory, while the 'snow' barely had any basil flavor. 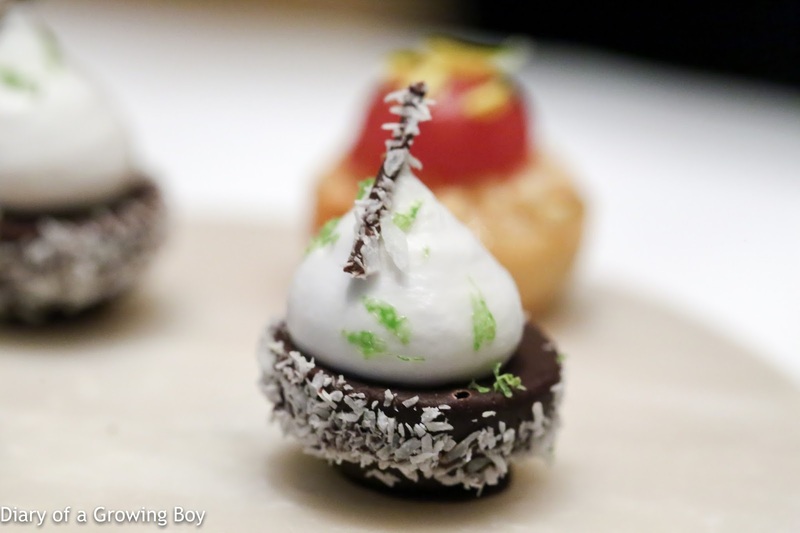 A very pretty dish, and tasty, too. 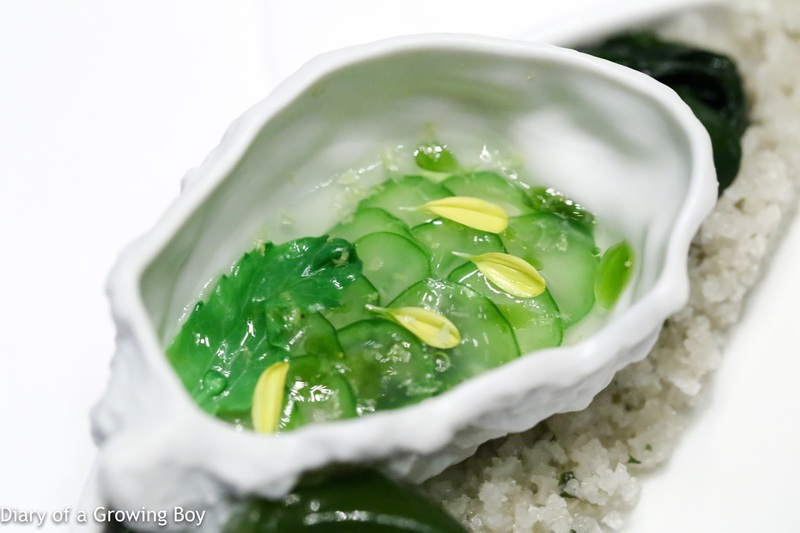 The oyster from Brittany was steamed at 70°C, then covered with a layer of thin slices of kailan (芥藍) as well as plankton gelée. Decorated with a few petals of mustard flowers. 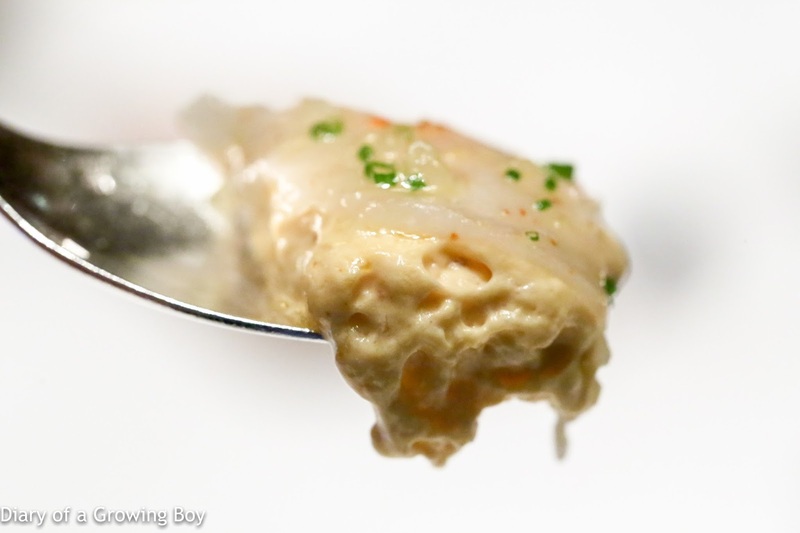 The oyster itself was very creamy in texture - and a little more firm thanks to being steamed - while the metallic, briny flavors remained. 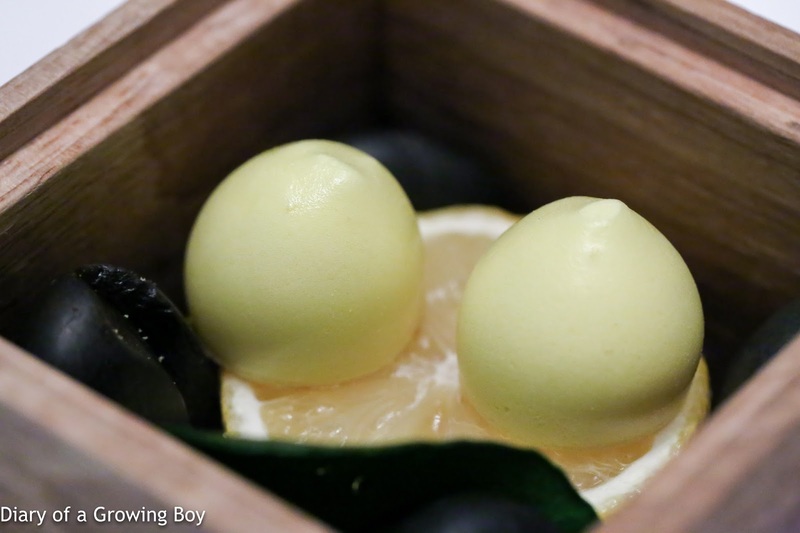 The acidity from the lemon jello worked very well with the other flavors here to achieve balance. 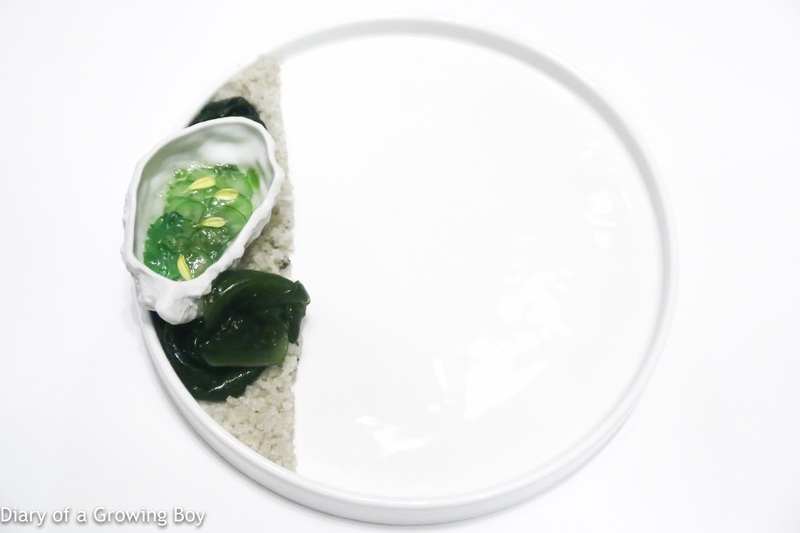 So we've got a layer of minced raw Brittany langoustine on top, with a layer of Hokkaido sea urchin espuma (Richard did WHAT to sea urchin??!!) just below, and chunks of poached jicama and kabu (蕪) buried underneath, along with chunks and chiffonade of Granny Smith. 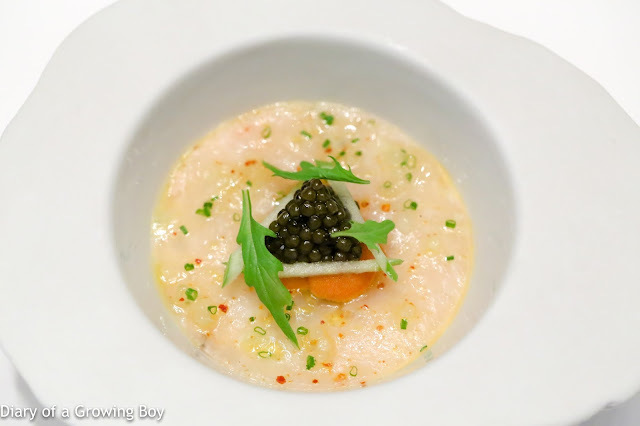 Garnished with a few tongues sea urchin and more schrenki caviar. Pretty nice, actually... 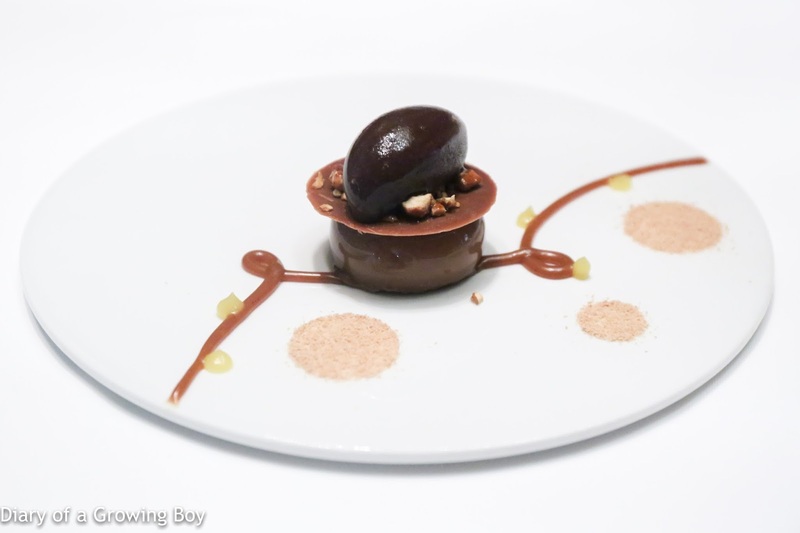 If one thinks about it, one can almost see how Richard has substituted each of the main ingredients of his signature dish with something different - but at the same time familiar. 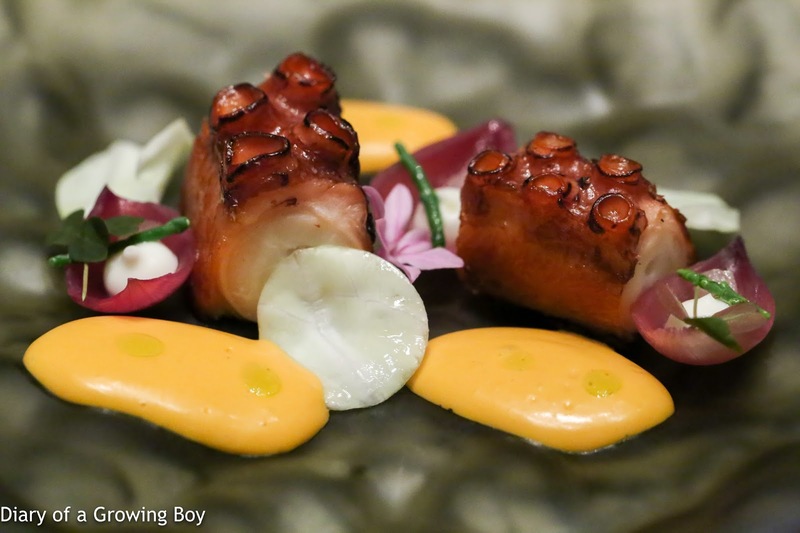 Cantabrian octopus: grilled over charcoal, coulis of fermented bell pepper with pearl onions and octopus cooking juice emulsion - lovely smoky flavors from the grilled octopus. These chunks came from the part of the tentacles closer to the head, so while they were fairly soft it still took a little effort to cut through. The petals of pearl onions came with pancetta mayo and salicornia - an ingredient for which Richard had offered to pay me handsomely should I have carried some back from the shores of the Aral Sea. The octopus went very well with the fermented bell pepper and cabbage coulis. 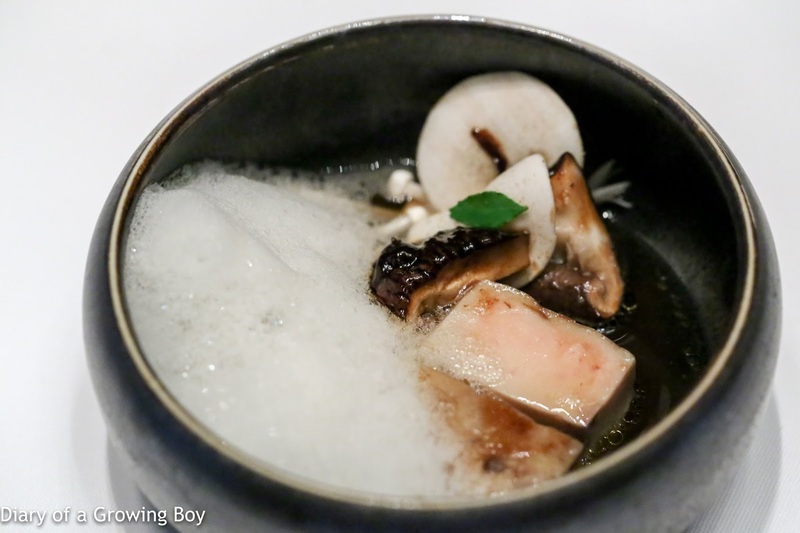 Duck foie gras: poached in mushroom tea with charred Japanese shiitake, pickled enoki and black garlic purée - Amber has always delivered perfectly poached foie gras, and tonight was no exception. 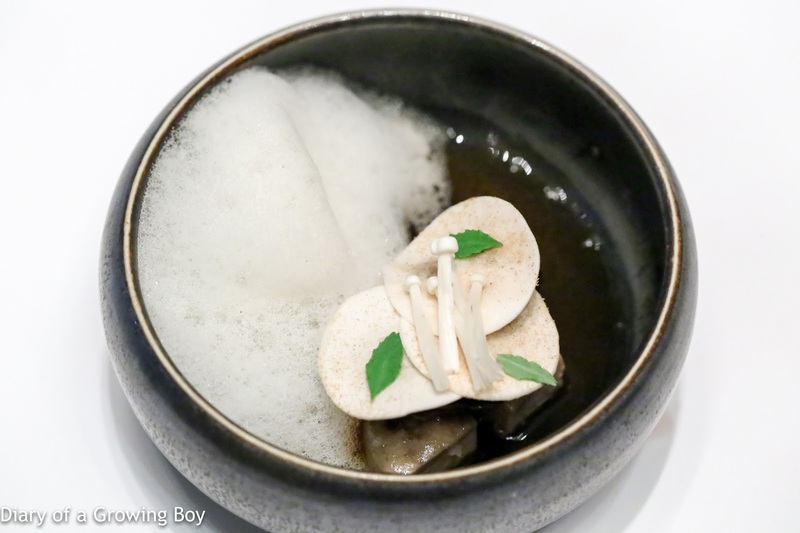 Tonight it came with foie gras foam as well as shiitake (椎茸), enoki (えのき茸), and button mushrooms, with some mushroom tea which was flavorful but not over-seasoned. 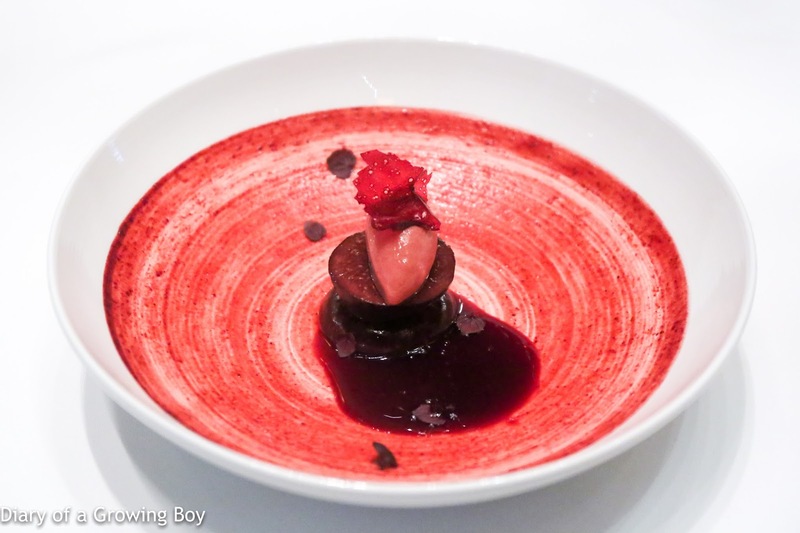 The black garlic purée was beautiful and sweet, with a lot of depth. 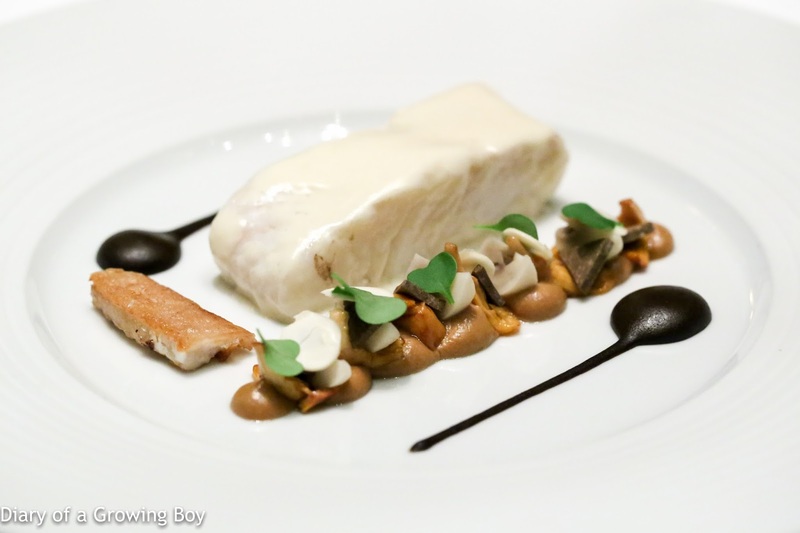 Line caught turbot: confit, crispy "beard", coulis of black autumn truffles, warm salad of wet hazelnuts, girolles and pickled mushrooms - Hello Kitty chose the Miyazaki beef - which is delicious but I consider somewhat boring - so I had to pick the turbot. Well... unfortunately I found this boring, too... 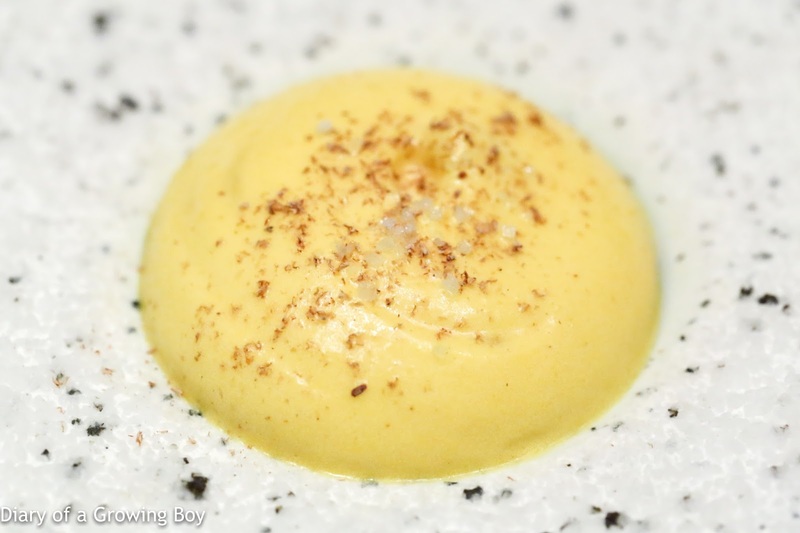 While the turbot from Brittany was slow-cooked and the execution was on point, the mushroom sauce covering it was just too bland and uninteresting - and desperately needed the black truffle coulis to add some personality. The crispy 'beard' cooked a la plancha that was served on the side was much better, as was the mix of girolles, wet hazelnuts, and mushrooms. 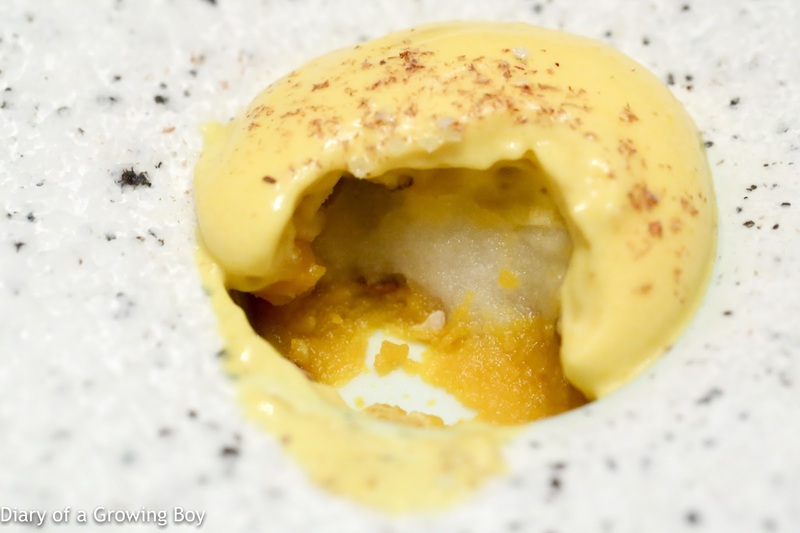 Kabocha pumpkin: and coconut milk foam, over a menton lemon and nutmeg sorbet with caramelized pumpkin seeds and 'fleur de sel' - the coconut flavors were very subtle as the pumpkin dominated. The chunks of pumpkin inside were very sweet, while the seeds showed toasty flavors. 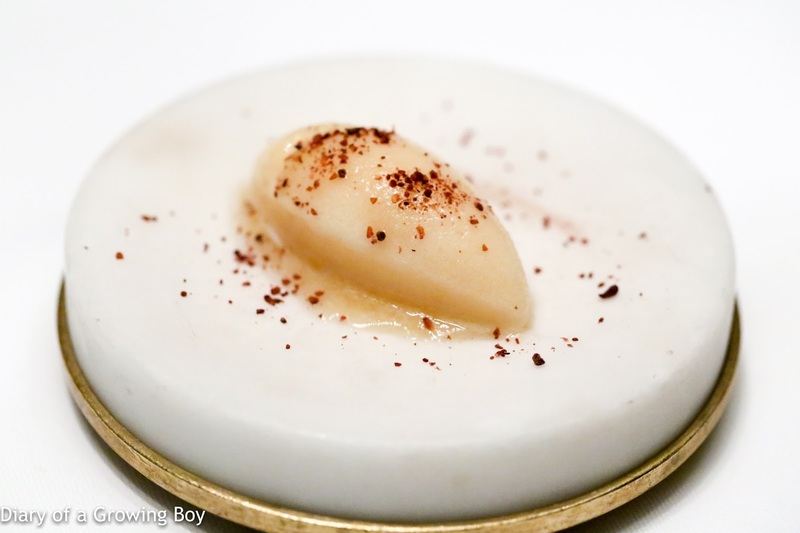 The acidity in the lemon sorbet was certainly noticeable, while the fleur de sel brought an interesting dimension. Cavaillon melon sorbet - with a little sumac for contrast. 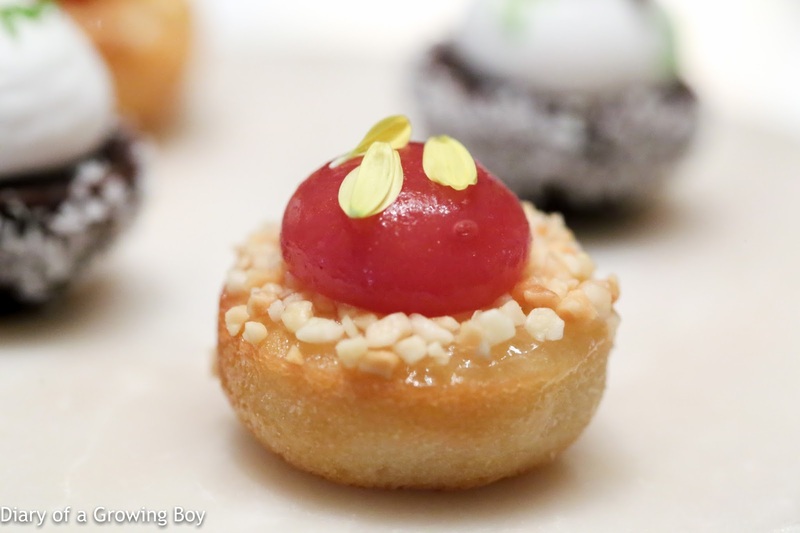 Peach financier - a little underwhelming. 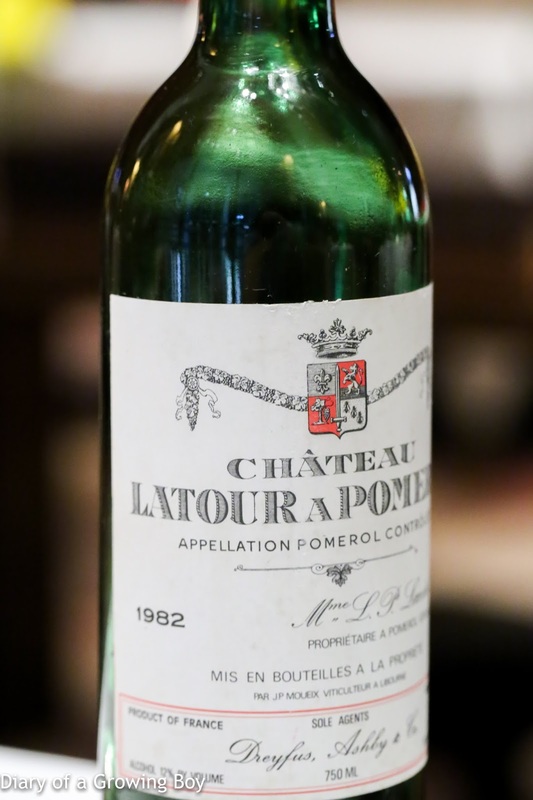 1982 Latour à Pomerol - opened an hour and 45 minutes prior to serving without decanting. Wonderful nose showing smoky, tobacco, pencil lead, and fragrant woodsy notes, with some sweet fruit underneath. Good acidity on the back end. The wine drank very well but peaked somewhere between 2½ and 3 hours. Another delicious meal, and surprisingly we did not walk out of the restaurant thinking that our stomachs were on the verge of exploding. 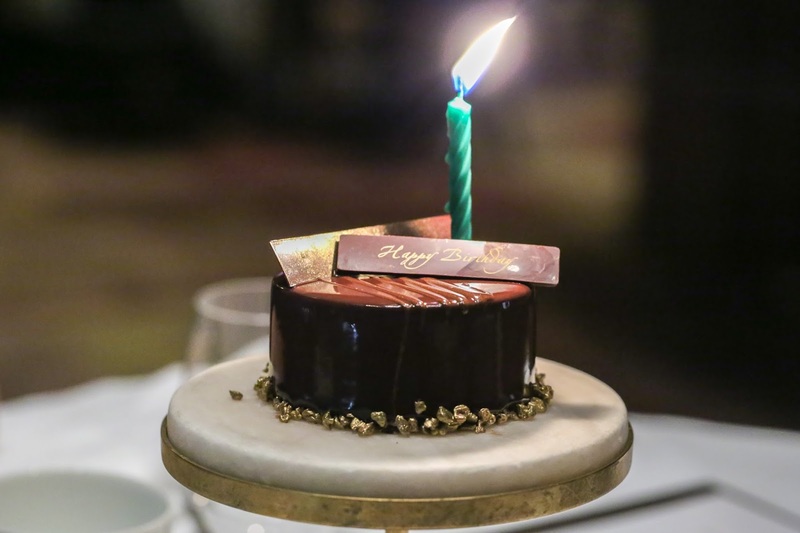 Many thanks to Richard for adding "PRIMA DONNA" to my profile at the restaurant so that we would get extra pampering from everyone, and of course we were grateful to have been comped the bubbly and the delicious caviar tart at the end of the evening.